A 22-year-old man described as a social outcast with wild beliefs steeped in mistrust faced a federal judge Monday and was ordered to be held without bail on charges that he tried to assassinate Rep. Gabrielle Giffords in a Tucson, Ariz., shooting rampage that left six people dead. U.S. Magistrate Judge Lawrence Anderson asked Jared Loughner if he understood that he could get life in prison - or the death penalty - for killing U.S. District Judge John Roll, one of the six who died in the rampage at Giffords' meeting with constituents Saturday. "Yes," he said, standing at a lecturn in his beige prison jumpsuit. A U.S. marshal stood guard nearby. CBS News Correspondent Bob Orr reports from Washington that there is no indication that anyone, including Loughner's parents, knew of his alleged plans for Saturday's shootings. Loughner entered the courtroom handcuffed. His head was shaved and he had a cut on his right temple. The alleged shooter leaned into a microphone as he responded to several procedural questions from Anderson. The charges against Loughner include one count of attempted assassination of a member of Congress, two counts of killing an employee of the federal government and two counts of attempting to kill a federal employee. More charges are expected. "We are devoting all the necessary resources that a case of this magnitude demands," Arizona U.S. Attorney Dennis Burke said in a written statement issued after the hearing. "We are focused and we are determined to achieve justice." Public defenders asked that San Diego attorney Judy Clarke, who defended Oklahoma City bombing conspirator Timothy McVeigh and "Unabomber" Ted Kaczynski, be appointed to represent Loughner. Loughner's expression was impassive as he walked in, looked straight at the crowd at the back of the room packed with reporters, then turned around to speak to Clarke. The courtroom was under heavy guard with about a dozen U.S. marshals. Political Fallout From Shooting in D.C.
Clarke, a former federal public defender in San Diego and Spokane, Wash., is now in private practice in San Diego. She served on teams that defended several notorious criminal suspects, including 9/11 conspirator Zacarias Moussaoui, McVeigh, Kaczynski, Atlanta Olympic bomber Eric Rudolph and Susan Smith, the South Carolina woman who drowned her toddlers in 1994. Throngs of reporters and television news crews lined up outside the federal courthouse, where the hearing was moved from Tucson. The entire federal bench there recused itself because Roll was the chief judge. Hours earlier, the nation observed a moment of silence for the victims of the rampage, from the South Lawn of the White House and the steps of the U.S. Capitol to legislature beyond Arizona and the International Space Station. Sheriff Clarence Dupnik said Loughner was not cooperating and told ABC's "Good Morning America" the suspect had said "not a word" to investigators. Dupnik said authorities were all but certain Loughner acted alone, saying "he's a typical troubled individual who's a loner." The FBI has interviewed a former roommate of Loughner's who said that sometime between Christmas and New Year's the 22-year-old showed him the gun that he had purchased, Orr reports. That made the ex-roommate uncomfortable, but Loughner made no threats and that meeting was not reported to anyone else. Investigators have found no evidence that Loughner has any connection to any hate or fringe group, Orr reports. The FBI continues to comb through computer files, notebooks and phone records to learn more about him. In total, 19 people were shot in the rampage outside a supermarket where Giffords held her meeting. Giffords was shot in the head, and remains in intensive care. Among the six people killed were a 9-year-old girl who was born on the day of the Sept. 11, 2001, terrorist attacks and was interested in public service as well as one of Giffords' aides. 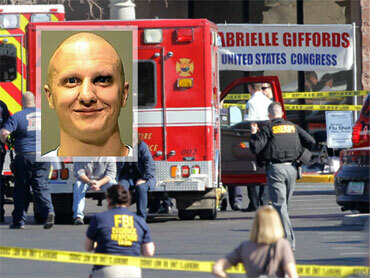 Loughner was tackled to the ground minutes after the shooting began, authorities said. He has been silent ever since.